Denzel Washington was born on December 28, 1954 at 00:09 AM in Mount Vernon, NY (40 N 54 /73 W 50) (source: AstroDatabank, Rodden Rating AA). Not to overwhelm you with information, we will only assess the horoscope of Denzel Washington by looking at the factors that only have some meaning for his love life. a strong 1st Quadrant (houses 1, 2 and 3) and no planets/bodies in the 3rd Quadrant (houses 7, 8 and 9). A strong first Quadrant brings a self-sufficient, self-reliant personality who is quite set in his ways. Denzel needs time for himself, to develop himself. Because no planets or bodies are in the 3rd Quadrant 'of the other(s)', there may be some fear encountering other(s), being lived or influenced by others. The Mars-Saturn aspect is important because Mars rules his 7th house of encounters, relationships and the (significant) other. Saturn represents the hook, the more so because Saturn is in a fixed house (the 2nd house) and in a fixed sign (Scorpio), denoting a very stable (even inert) relationship. Saturn sticks to the partner (Mars, ruler of the 7th house). The exact Sun-North Node conjunction at the same numerical degree reveals that Denzel Washington is very self-conscious. The Sun represents creative self-expression and the combo with the North Node reinforces the urge to be meaningful and to develop one's creative urges with full passion. 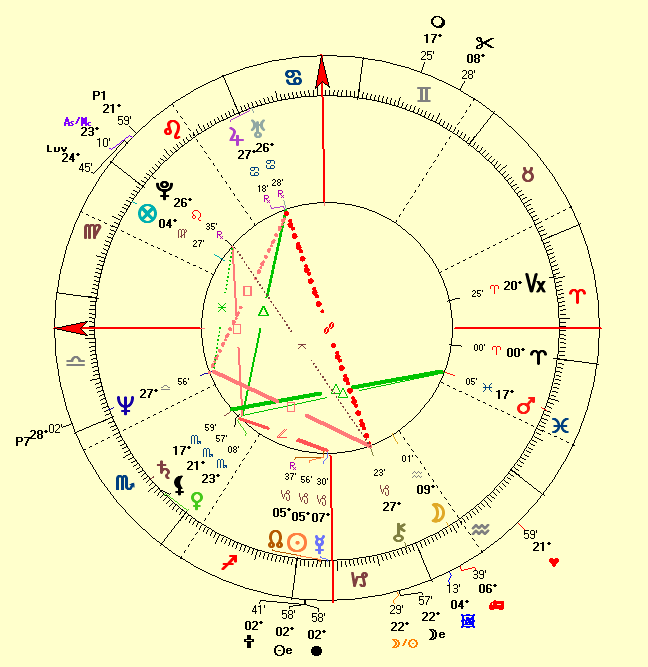 The Sun-North Node conjunction squares his Ascendant-Descendant axis of relationships indicating some rebellious, bold and/or difficult personality traits that may harm or challenge his relationships (in a wide sense) and the people he encounters. A stellium in the formal sign Capricorn shows an ambitious personality. Denzel Washington wants to elevate himself from the mass (reinforced by the Sun-North Node conjunction), wants by any means to be of importance in society and he craves social prestige. The very exact midpoints in a horoscope are always so very revealing. Especially Sun/Moon and AS/MC midpoints are always highly important and must be considered first. 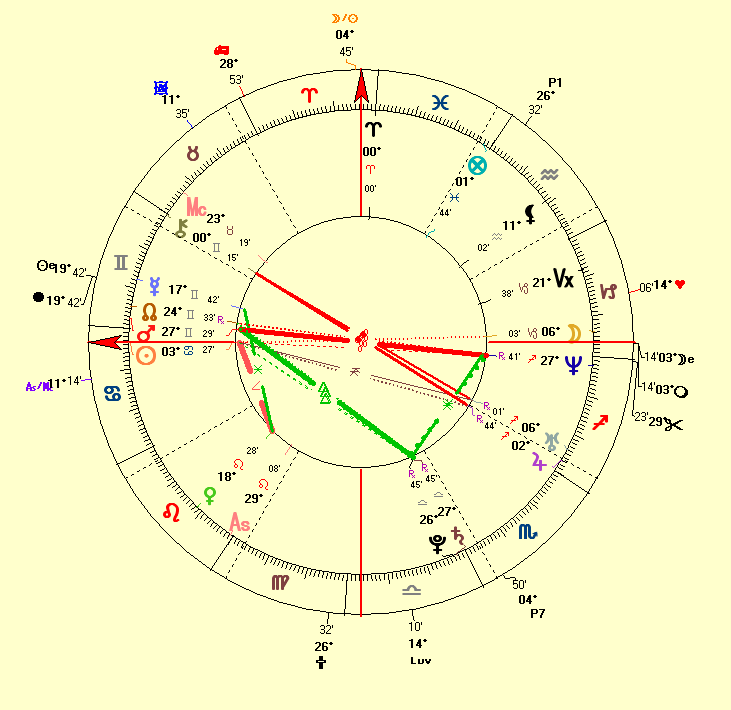 The VE=AS/MC=ME/MC planetary picture suggests a very charming person who enjoys beauty, harmony and has artistic interests (confirmed by the Libra Ascendant). The MA=PL/AS midpoint is often found in the natal chart of sporting men and people who have courage, take some risks and are able to push through. The AS=ME=MA/NE picture is about not disclosing his activities and plans. There are secrets he won't talk about. Denzel Washington got married on June 25, 1983 (time and place unknown). Hence, the marriage horoscope below is calculated with the Sun on the Ascendant. We cannot take into account the Moon's position. We will only look at what stands out on that day (and that's not much). there is an exact Mars-Saturn-Neptune configuration at the same numerical degree (27°): Mars trines Saturn and opposes Neptune. In this marriage horoscope an exact Mars-Saturn-Neptune configuration at the same numerical degree suggests death through illness. This can be a very persevering combination or pattern that reflects lots of determination. Saturn and Pluto are conjunct as well so that Pluto is involved in the pattern as well. Because Pluto is not at the same numerical degree, its influence is less powerful though. Any Saturn-Pluto combo is known for its stability and holding tight. We did not rectify his natal chart though. But what has Astrodamus to tell us about his future (love) life?